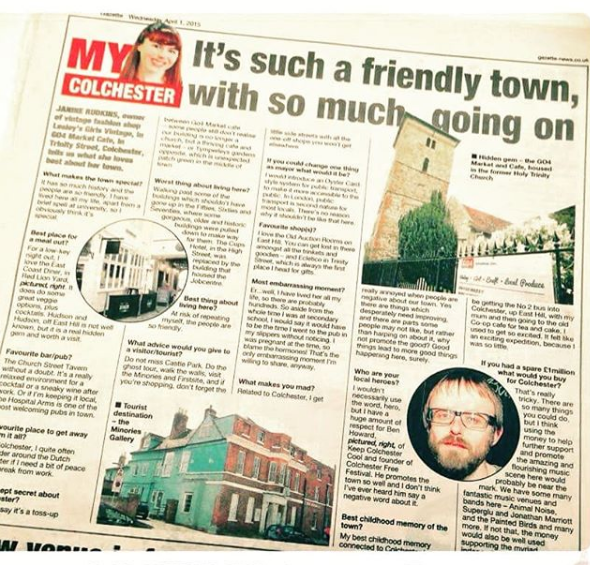 Today I was reminded of an article I featured in three years ago about Colchester- I was all about how amazing my hometown was, you could not have a conversation with me without me dropping in how much I loved this town- I even featured in a video about how much I loved this town. That love in part was based on the fact that I (like many others) was a lover of my town due to the virtue of circumstance. I fell in to living in the town after leaving university, had children here, bought a house here, married here. Ultimately I have divorced here. It could have been London or Brighton. And it very nearly was. You choose your life, you choose your mood, you choose to be happy, sad, grateful, discontent or angry. I knew a basic fact, I learned it at seven years old and have lived by it ever since- that to be happy I had to appreciate what I had and be grateful for it- to love it. To bemoan my fate here was to fall into a spiral I didn't think I would ever escape, one of dissatisfaction. And so I loved Colchester in all its forms. I did not denigrate the town, its inhabitants- which included myself and my friends. My family. When people mocked or pulled out tired anecdotes about how this town was filled with boring, uninspiring people, which I felt included me, I riled, I got angry, I protested. However, coming with this unswerving devotion and gratitude to this town was also a trap- one where you accept the town and the life in it (and by extension your own life) as it is in that moment, not for what it could become, and the hopes and dreams that come with it. And so I changed- I knew that to be happy- gratitude and love was the right path to take, but it was not enough alone. I had to make a choice, I had to change, work towards my dreams both personal and in business. 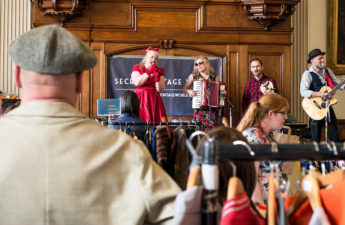 So I did, which in part resulted in my businesses, a desire to create events here and promote the people in this town, it also resulted in changes to my personal life. These all, in turn, led to a rallying against that town I called home, a town I had once claimed I loved so much, I became so angry I actively disliked being here. You see, originally I never wanted to stay here, it was never where I thought I was 'supposed' to be, but years of experience and heart ache, and pain had taught me to work with what I have, be content or watch your life slide passed your eyes in an endless desire for more, more, more. Desire, dreams, ambition- all are good an vital to your growth, but not at the expense of love and contentment. And for a time I struggled with balancing the two. Now I think I can. So in part this is why I write this post today. I do want to experience life in other towns, even countries, I want to do more, see more places, I want to see this town grow and change, I want to see the people in it blossom and not let the town fall in to an unloved hole of negativity. One day I may live elsewhere, work elsewhere. But this is the place that has held me for over 30 long years, been there for me, watched me, been the scene for my life dramas and futures, boring moments, drunk moments, parties, arguments, hysterical jokes. The place my mother died, I met my ex-husband, left my him, had two children, started businesses, ran events, made new friends, learned to drive, fell off my bike a thousand times, argued, fought, laughed, loved and lost. And as much as I have a dream, a passion and a desire for the future I still love this town, it will always have a place in my heart, I will always support it, come back to it, praise it and love it, likewise the people, the walls of every cafe, restaurant, nightclub, castle, abbey ruins, theatre, Victorian water tower, art gallery, museum, church, arts centre and all of the million places in this town that we are so very lucky to have. And the people in this town are part of what makes it so special. They are thousands of unique and special individuals and they are passionate and loving. The event organisers who create events to bring the town together, the shop owners who smiling (or unsmiling sometimes) open their shops every day, the man who chalk draws on the pavement to make a few pence for food or shelter, the retired fireman who dedicates his time to creating a charity to support the homeless, the single mum who runs a website celebrating all things indie Colchester, the book shop the fights against Amazon with a smile and a sparkle, the million characters who I could spend a million years talking about. 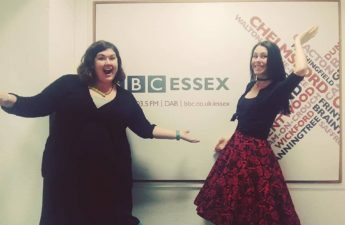 So this post is in praise of Colchester which will always be part of me, and me it wherever and whenever I go from it. This video I did last year for one of my events sums up all the beautiful places in it and people who are part of it!